Discovered in 1808 by Sir Humphrey Davy in London. 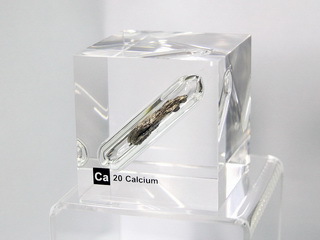 Calcium is a silvery white metal which is obtained by the electrolysis of molten calcium chloride. It is one of the most abundant metal elements on Earth (41000 ppm), but it never occurs as the pure element, the main deposits being limestone (CaCO3), Dolomite (CaCO3.MgCO3) and Gypsum (CaSO4.2H2O). Calcium compounds have many applications; for example, calcium chloride is used extensively to dry gases as it is capable of absorbing moisture from the atmosphere. Calcium oxide (lime), produced by heating limestone, has many applications including the chemical, agricultural, construction and water industries. 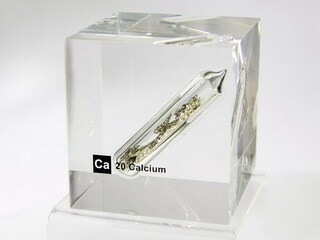 Calcium is an essential constituent of the human body which contains, on average, 1kg. of the element.